It's the company's first new phone since 2016 and its first since its $800M acquisition by Best Buy. Fresh off the news of its acquisition by Best Buy, aging in place tech company GreatCall has announced the Jitterbug Smart2, the first update since 2016 to its line of smartphones for seniors. It was the original Jitterbug flip phone for seniors that first launched the company in 2006. Since then the company has grown to include a senior care call center and a line of personal emergency response devices, as well as a variety of smartphones, apps, and wearables. Like previous devices in the series, the watchword for the Smart2 is simplicity, sourced in this case from extensive interviews with current and potential users, VP Product Development John Chin told MobiHealthNews. 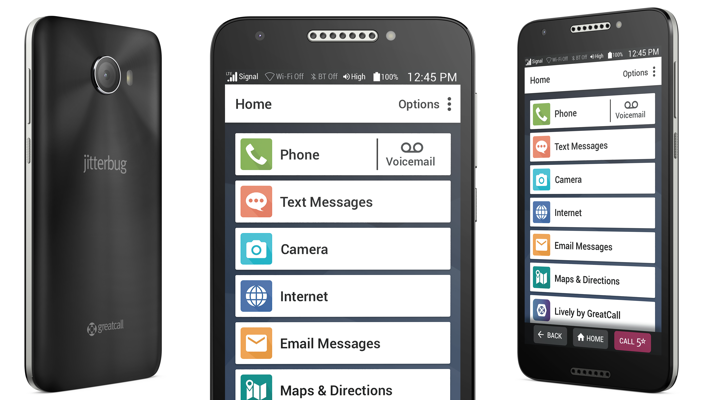 The phone features a simplified menu of apps that seniors are typically most interested in: phone, text messages, camera, internet, email, maps, and the Lively app (GreatCall’s mPERS line). It also includes a 5Star Urgent Response button for contacting emergency services via GreatCall’s call center. Jitterbug works with longtime partner Alcatel to provide the connectivity. The phone will be available for $149.99, with data plans starting at $17.48 per month. It will hit retail stores — including, presumably, new owner Best Buy — September 3rd.